Have you ever seen a situation and think to yourself “there ought to be a law” on that? If you answered yes, Assemblymember Cristina Garcia wants to hear from you. Garcia has launched her third “There Ought to Be a Law” contest in the 58th Assembly District and is inviting constituents from the cities of Montebello, Pico Rivera, Commerce, Bell Gardens, Downey, Norwalk, Bellflower, Cerritos and Artesia to submit ideas or proposals for a new state law she can introduce in Sacramento. Entries should focus on issues to improve government or the quality of life in our neighborhoods throughout the state of California, according to Garcia. There is no age requirement to apply and Garcia said she is encouraging everyone, including school aged children and college students to participate. The city of Bell Gardens has been particularly well-represented in the past two competitions. Fifth-graders at Bell Gardens Elementary School submitted last year’s winning bill idea. Assembly Bill 146 encourages that the “Mexican Repatriation,” the unconstitutional deportation in the 1930’s of over 1 million U.S. citizens and lawful residents of Mexican descent in California, be included in student history textbooks and studies. The new law took effective Jan. 1. The year prior, Garcia introduced legislation inspired by a submission by Bell Gardens residents Sally and Ron Hoyt: Assembly Bill 1596 required all vote-by-mail applications, when completed, to be mailed directly to the county registrar’s office and not to middlemen or political campaign organizations. AB 1596 became law in 2015. At least one winner will be selected and have the opportunity to travel to Sacramento, testify before an Assembly Committee on the merits of the bill, and have lunch with the assemblywoman, according to the competition announcement. The deadline to apply is Jan. 20. Submissions can be sent by mail, e-mail, or fax or online at: http://asmdc.org/members/a58/other-resources/there-ought-to-be-a-law-form; faxed to (562) 861-5158 or mailed to: Office of Assemblymember Garcia, 8255 Firestone Blvd. Suite 203, Downey, CA 90241. For more information, visit Garcia’s website or call her district office at (562) 861-5803. Feminine products could one day be tax-exempt in California under a proposed bipartisan bill introduced in the Assembly Monday. On the first day of the 2016 legislation session, Assemblywomen Cristina Garcia and Ling Ling Chang introduced AB 1561, which exempt feminine hygiene products such as tampons and sanitary napkins from sales tax. California collects over $20 million annually in sales tax from feminine products, according to the Board of Equalization. The assumption is the tax collected is paid almost exclusively by women, who spend an average of $7 a month over 40 years on the products. “This is not insignificant to women, especially poor women on a tight budget who struggle to pay for basic necessities like a box of tampons or pads every month for their adult life,” Garcia said. Under state law health items like walkers, medical identification tags, prescription medication including Viagra, are not taxed. “When we look at other items that are tax exempt, I think it is only fair that these essential female products be included,” Garcia stressed. The end to the “tampon tax” would bring more gender equality to California’s tax code, she added. “Our government is imposing a charge exclusively on women by forcing them to pay extra for the ‘privilege’ of a health necessity,” said Chang, who represents the 55th assembly district. To date, Maryland, Massachusetts, Minnesota, New Jersey and Pennsylvania are the only states that do not tax feminine hygiene products. Every Sunday for the past year Assemblywoman Cristina Garcia has recognized acts of kindness by an individual or positive impacts by a group in her district that often go unnoticed. Now, the assemblywoman will pay an extra tribute to the “best of the best” in the 58th District. From a man who picks up trash along the riverbed to an environmental justice group fighting a toxic polluter, every week constituents in her east/southeast area district — encompassing the cities of Artesia, Bell Gardens, Bellflower, Cerritos, Commerce, Downey, Montebello, Norwalk and Pico Rivera —vote online for the nominee to be recognized by Garcia’s #Pride58 Community Recognition Program. “It was really important for us to tell our own story, not what was drawn out by the negative publicity in our area,” Garcia told EGP, referring to the corruption scandals in southeast communities that at times dominated news headlines. The assemblywoman hopes to end the year honoring the community’s favorites. A special dinner gala will be held in mid January at the Bell Gardens Bicycle Casino Hotel to announce and recognize the #Pride58 “Best of the Best” award recipients. Constituents were allowed to vote once a day until Tuesday for a recipient in in each of the following categories: Helping Hand, Outstanding Community Impact Award, Leaders of Tomorrow, Honor Roll and Partner of Progress. “We are looking to recognize the positive work being done in our community often behind the scene that is improving the lives and the conditions of our neighbors and fellow citizens,” Garcia said. #Pride58 awardees in the running include Daisy Gomez, 25, of Montebello who opened an outlet store and often provided her extra sweaters and blankets to the homeless. Robert Lopez of Montebello was also honored earlier this year when he was nominated by a neighbor who saw Lopez walk along Bluff Road every Saturday picking up trash and mowing down weeds. “I’ve lived on Bluff Road most of my life, and I can honestly say, Robert Lopez is the only person I have ever seen who cares enough about our neighborhood,” said his neighbor De Anne Susino. Pastor Richard Jarman of TouchPoint Church was recognized for his work at the Bell Gardens faith-based council. Jarman has been providing food, clothing and beds for needy families and children in foster care. He also worked with the Southeast Community Development Corporation to coordinate and establish a computer lab at the church. Commerce-based East Yards Communities for Environmental Justice, an organization that advocates for a safe and healthy environment was one group recognized earlier this year. 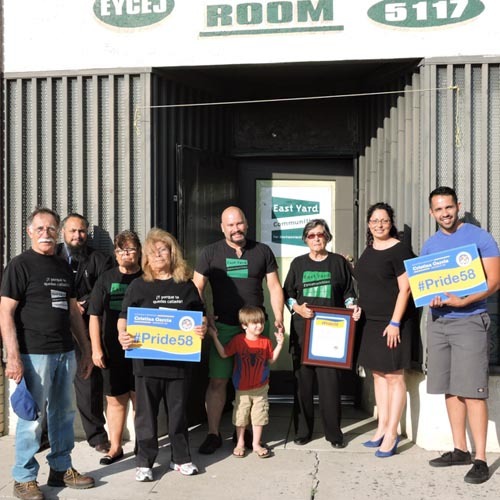 EYCEJ brought environmental and air quality issues to the forefront in Commerce, Bell Gardens and the Eastside. Mark Lopez, Director of EYCEJ, told EGP the award demonstrates the local assemblywoman is in in touch with what is happening on the ground. He considered the recognition an important part of relationship building and an invitation to work together, he added. At an event recognizing women making a difference in their communities, Assemblymember Cristina Garcia praised the work these women are doing in her district, and expressed hope more women will soon take on leadership roles in Sacramento. Reflecting on her peers in the California State Assembly, Garcia said as one of the very few women in state office, she sometimes feels like a second-class citizen. Now in her third year representing the 58th district, Garcia said there needs to be more women in the California Legislature. “It is time for us as women to start demanding our half of the pie,” she said Friday during her annual Women of the Year event at the Southern California Edison facility in Downey. Women make up half of the country’s population, yet their numbers in elected office fall far short of parity in the political arena, she pointed out. There are currently only 31 women in the State Legislature – 19 out of 80 elected officials in the State Assembly and 12 out of 40 in the State Senate. The lack of female representation in Congress is just as staggering. Of 435 U.S. Representatives, only 82 are women. Similarly, out of 100 U.S. Senators, only 21 are women. Minorities are also disproportionately underrepresented. “We don’t have a single Latina in the State Senate,” Garcia pointed out. Worse still, the number of women in office is decreasing. Women can’t just settle for the small gains that have been made, they need to do more, she said forcefully. Being a woman in state office can be lonely, according to the assemblywoman. She said male legislators tend to work closer with other men than their female counterparts. “I don’t get paid more for being a woman but I sometimes find myself having to work ten times more than my [male] colleagues,” she complained. Some of my male colleagues still make sexist remarks and I have to call them on it, she said incredulously. 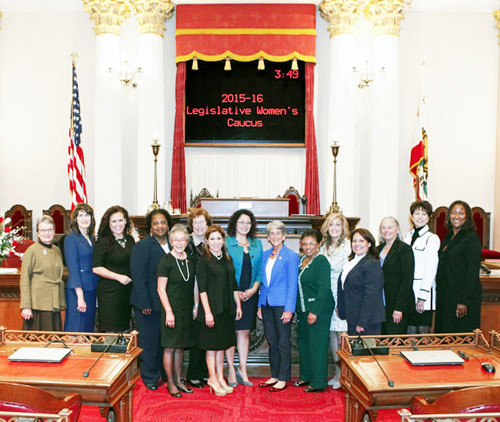 Last year, Garcia was nominated to serve as vice chair for the California Legislative Women’s Caucus, which represents and advocates on behalf of the interest of women, children and families. She at first did not feel ready for the added responsibility, but quickly realized it would be the opportune position to advocate for more women in politics and to recognize those women who make a difference in their communities. In February, EMILY’s List nominated her for its 2015 Gabrielle Giffords Rising Star Award. Following the event, Garcia told EGP she believes the best way to address the shortage of women in elected office is to prepare more women for the job. She said she is hopeful the tide may be turning. “We may have our first female president” soon, she said excitedly. A national women’s political organization that has raised hundreds of millions of dollars for women candidates for office has nominated Assemblywoman Cristina Garcia of Bell Gardens for its 2015 Gabrielle Giffords Rising Star Award. The award is decided via community input submitted online. Sponsored by EMILY’s List, the award is dedicated in honor of the “dedicated and courageous” former Rep. Gabrielle Giffords. It is awarded to a woman in local or state office whose work shows an extraordinary “commitment to community, dedication to women and families, and determination and civility that have been the highlights of Gifford’s. The first ever Rising Star Award was given to Georgia House Minority Leader Stacey Abrams in 2014. The group stated that has been Garcia a strong advocate of efforts to bring about political reform and increased transparency in her community, where scandals and corruption have been a major issue. She has also advocated for to empower women — actively recruits and mentors more women to run for the State Legislature. The Gabrielle Giffords Rising Star Award winner will be chosen with community input. Online voting can be found here: Vote for the 2015 Rising Star.